All three small drones that crashed in South Korea in March and April came from North Korea and were programmed to return to their departure points there, experts have established. The Defense Ministry on Thursday announced the findings of an investigation by South Korean and American experts which it said confirmed the drones' points of departure and return based on its analysis of the mission data -- prearranged GPS coordinates -- encoded in the flight computers. The three unmanned aerial vehicles were found in Paju, Gyeonggi Province, Samcheok, Gangwon Province, and on Baeknyeong Island in the West Sea. The mission data showed that the drones were not remote-controlled but programmed to fly according to the GPS coordinates and take photos before returning. Their points of departure and return were 5 km northwest of Kaesong for the drone discovered in Paju on March 24; 27 km southeast of Haeju, South Hwanghae Province for the one that crashed on Baeknyeong Island on March 31; 17 km east of Pyonggang, Kangwon Province for the UAV found in Samcheok on April 6. "The GPS coordinates programmed the three drones to fly over several military facilities" in South Korea, a ministry official said. 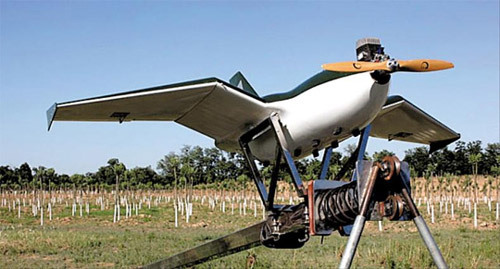 The drones look like toy planes and would be capable of carrying 3 to 4 kg of explosives with a maximum blast radius of up to 20 m, the ministry said. The ministry is treating the intrusion into South Korean airspace as a violation of the armistice agreement and the inter-Korean non-aggression pact, and as an "obvious military provocation." It will deliver a strong warning to the North through the UN Command. The ministry also promised to deploy new low-altitude radar detectors, anti-aircraft guns or other equipment capable of detecting and striking UAVs. The North apparently imported Chinese UAVs via Hong Kong and then copied or remodeled them. The Paju and Samcheok drones looked strikingly similar to the SKY-09P model made by China TranComm and the one that crashed on Baeknyeong Island like the UV10CAM made by MicroFly. They are commercially sold. That the North was able to convert them to military use points to gaping loopholes in international economic sanctions. Intelligence authorities speculate that the North began developing small UAVs in 2010 and recently started using them for surveillance at the orders of leader Kim Jong-un. They are fairly primitive and could be made by any South Korean engineering undergraduate. They are also prone to failure. The Paju drone seems to have crashed due to engine trouble, the Samcheok drone because the GPS malfunctioned, and the Baeknyeong drone ran out of fuel. "The North's UAV technology still seems primitive," a military spokesman said. "But nobody can rule out that the North will develop them enough for effective reconnaissance and attack purposes in a few years." The Baeknyeong drone was supposed to fly a combined distance of about 423 km if all navigation routes encoded in its mission data are connected, roughly the distance between Seoul and Busan, meaning it has a range of 400 km from the demilitarized zone to reach the southern part of the country. A UAV expert said they could be used to carry biological or chemical weapons in terrorist attacks.